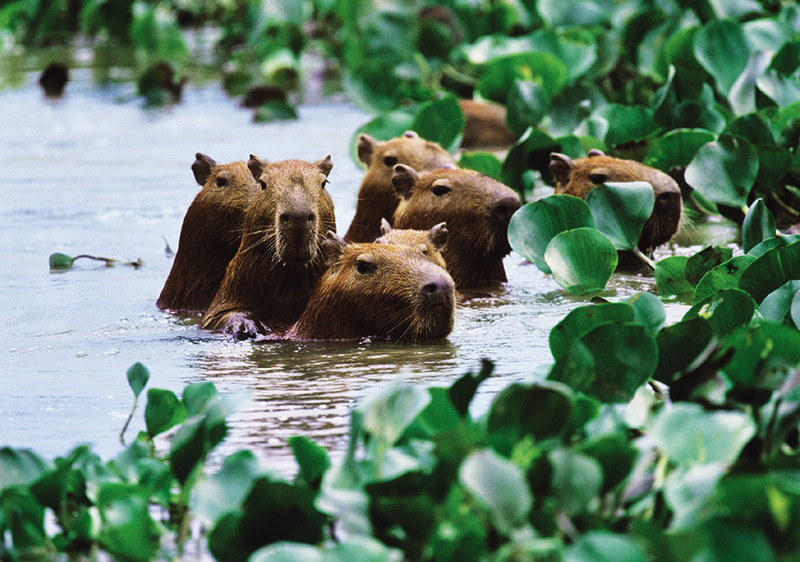 Capybara, Los Llanos region, Venezuela. Photograph by Art Wolfe. Looking something like a gopher on steroids, the capybara (Hydrochoerus hydrochaeris) is the world’s largest rodent, standing about two feet tall at the shoulder when fully grown. Widespread across South America east of the Andes, this social, semiaquatic creature prefers to live in large groups near waterways. To escape danger it can stay underwater for up to five minutes, and its partially webbed toes make it a splendid swimmer. Though capybaras feed mostly on grasses, they will also gladly partake of a farmer’s fruit, vegetable, and grain crops, should the opportunity arise.